PHOENIX -- That oughta do it. 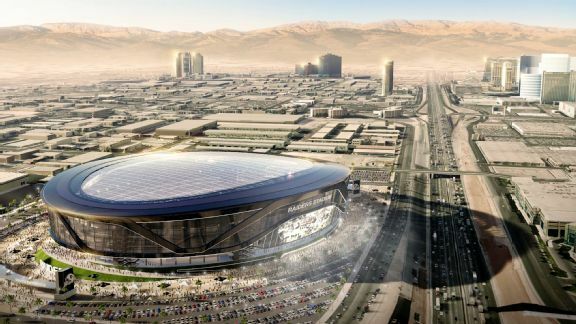 The NFL's two-decade blitz of stadium development largely ended this week with the granddaddy of them all: a nearly $1 billion gift from the tax coffers of Nevada to lure the Oakland Raiders to Las Vegas for the 2020 season. With the Raiders' future settled, there are no more NFL stadium flashpoints on the near horizon and -- more importantly -- no obvious cities to be used as leverage against municipalities that refuse to provide public assistance. Perhaps the only team with a looming issue is the Buffalo Bills, who might soon push to replace 44-year-old New Era Stadium, but they have a lease through 2023 and are just three years removed from $130 million in taxpayer-funded renovations. • FAQ: Is Vegas market size a concern? • More: When will Vegas stadium be done? • NFL Live: Is move good for the NFL? • Marshall: Vegas a trap for young players? • Video: Will Raiders fans disown team? • Poll: How do you feel about Vegas move? So after an era in which 21 new stadiums were built and three others were heavily renovated, thanks in large part to an estimated $6.7 billion in public money, the league appears to have hit a natural resting point. Monday, I asked Eric Grubman -- the NFL's executive vice president and point person on stadium politics -- if he agreed. "Yes and no," Grubman said. He noted there are three catalysts for a stadium crisis: an aging facility, a lack of recent maintenance and a short-term lease. "If you have those three things," he said, "the owner is going to be looking around -- and other cities are going to be looking around. You don't wake up one day and it happens. There is a drumbeat, and I don't see that drumbeat right now in any other city. "But if you take the long-term view, it's a constant thing. Owners and cities and fans need to understand that. If you build a house, it's not like you never ever do anything to the house for the next 30 years. You have to pay attention to it. It has to be a constant [maintenance]. Everybody's got to pull on those oars." Given his role in the league, we can't expect Grubman to say the league's stadium games have concluded. But commissioner Roger Goodell's long-standing goal to have "32 stable franchises in their market," a sentiment he reiterated Monday, seems close to fruition. The journey to this point includes some remarkable numbers that merit further inspection. I arrived at the $6.7 billion public price tag using public reports and research from John McTigue of ESPN Stats & Information. Not everyone classifies public money the same way, but here's how we landed on that estimate. Between 2000 and the start of the 2020 season, the NFL will have opened 16 new stadiums with the help of $5 billion in public contributions. Two of those stadiums didn't factor in that $5 billion -- MetLife in New Jersey and the in-progress megastructure near Los Angeles -- because they were financed with 100 percent private money. During the same period, the Green Bay Packers and Chicago Bears used $557 million in public money to gut and rebuild their buildings. In 2011, the Kansas City Chiefs received $262 million for a major renovation of 45-year-old Arrowhead Stadium. Those three projects totaled about $820 million in subsidies. Going further back, five franchises built stadiums from 1997 to '99 at a time when they were far less costly. Still, the Washington Redskins, Tampa Bay Buccaneers, Baltimore Ravens, Cleveland Browns and Tennessee Titans coerced a not-insignificant $873 million in combined public monies to help with construction. That's a big part of the how the NFL built a fortress of stadiums and became the richest sports league in America. The effort has been stunning in magnitude, brutal in its lack of sentimentality, and instructive for its insight into league operations. Most notably: the NFL doesn't bluff. Plenty of municipalities have wondered whether the league would yank franchises long intertwined in civic culture. Most chose not to find out and negotiated the best agreement possible. Those that did -- for their own justified reasons, in my opinion -- paid the price. The cities of St. Louis, San Diego and Oakland likely have lost pro football forever. In addition, the decision to "evolve" on the Las Vegas gambling issue -- and to look past its relatively low population and small business community -- raises the stakes for any future stadium standoff. There is now precedent to move to a nontraditional location. While no obvious relocation hosts come to mind at the moment, recent events suggest we shouldn't rule out places such as Toronto, Mexico City and London down the road. "It's not by accident that there are other markets that could be suitable for teams," Grubman said. "It's a high-class problem if all 32 are doing fine in their markets and we still have unfilled demand. Who wouldn't want that? We want that." Further, a word of caution is necessary as we attempt to put a bracket on this portion of NFL history. While you and I might have a hard time composing a list of stadium-needy teams, we should know that the hunger is insatiable. The Atlanta Falcons will move into Mercedes-Benz Stadium this season, just 25 years after they moved into the Georgia Dome. The Redskins have circulated "concepts" for a new stadium to replace FedEx Field, which opened in 1997. Still, Monday seemed to be the end of an era, a period when the NFL systematically moved its teams into revenue-generating behemoths, prioritizing finance over sentimentality at every turn. Dolphins owner Stephen Ross seems to think so, at least as it relates to public money. "You've got to look around," Ross said Monday at the owners meetings. "There's very little public money available for teams today. And if you own a team, you should have the deep pockets to deliver. You need some public money for infrastructure and things like that. But with the costs of stadiums today, our country can't afford to put all of the money in those things." But the league is making more money than ever, and the SportsBusiness Journal projects the NFL's annual revenues at $14 billion annually. If it's going to grow further, it'll have to find a way other than through new stadiums. For the moment, I think. Has to be, right? We shall see.